Opposition chairman: Kerry's peace proposal was historic opportunity but Netanyahu backed off because it would have dismantled Likud. Opposition chairman and Zionist Union leader MK Yitzhak Herzog on Sunday addressed reports that Prime Minister Binyamin Netanyahu rejected a plan for a regional peace initiative proposed by former Secretary of State John Kerry. Haaretz reported on Saturday that Netanyahu and Kerry took part in a secret summit in the Jordanian city of Aqaba a year ago, attended by Jordan’s King Abdullah II and Egyptian President Abdel Fattah Al-Sisi, in which Kerry presented a plan which included recognition of Israel as a Jewish state and a renewal of talks with the Palestinian Authority (PA) with the support of the Arab countries. While Netanyahu rejected Kerry’s proposal due to opposition from members of his coalition, Haaretz also reported that the Aqaba summit was the basis for talks that began two weeks later between Netanyahu and Herzog on establishing a unity government. Coalition talks between Herzog and Netanyahu ultimately fizzled and Netanyahu added Yisrael Beytenu to the government, appointing its leader, Avigdor Liberman, as defense minister. Speaking to Channel 10 News on Sunday, Herzog said the peace initiative was an historic opportunity, but Netanyahu “ran away” from it. 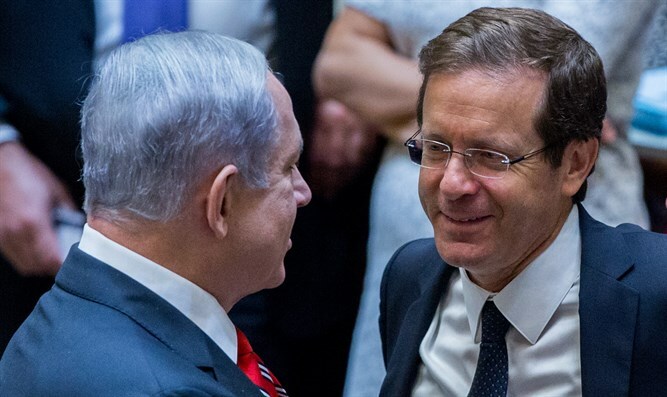 “Following that summit I met with Netanyahu for talks that lasted two days, we began to form a document and it was supposed to be revealed during the coalition negotiations and be presented in the Knesset, but Netanyahu ran away,” charged Herzog. Herzog told Channel 10 that his discussions with Netanyahu included limiting construction in Judea and Samaria and agreeing on separation from the Palestinians as part of a regional move. "I agreed with Netanyahu on five or six principles, among others on separation from the Palestinians, the completion of the construction of the fence, a freeze on construction outside the blocs and on a regional initiative, but then he brought Yariv Levin into the negotiations, who initially dissuaded him from talking about the blocs, and then from presenting the document at the Knesset because it would dismantle the Likud,” Herzog claimed. Netanyahu confirmed at Sunday morning’s Cabinet meeting that he attended the secret summit a year ago, but no additional details were provided.